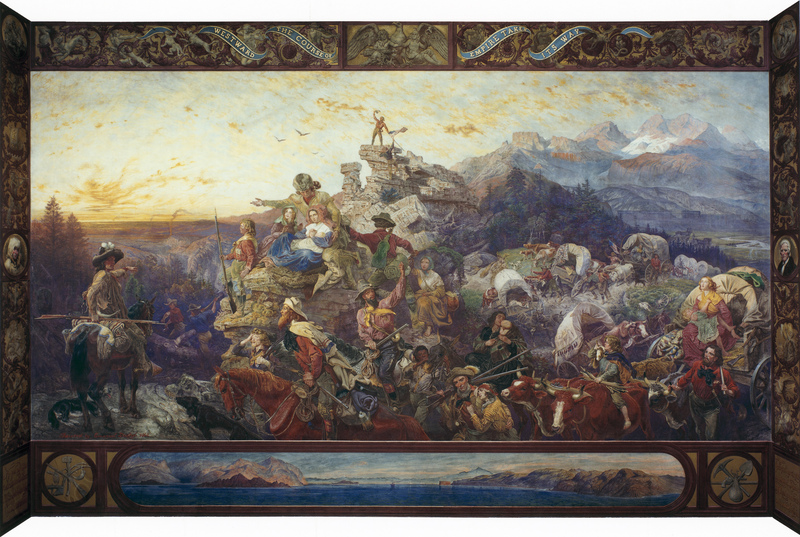 Emanuel Leutze’s mural celebrates the western expansion of the United States. A group of pioneers and their train of covered wagons are pictured at the continental divide, looking towards the sunset and the Pacific Ocean. The border depicts vignettes of exploration and frontier mythology. Beneath the central composition is a panoramic view of their destination “Golden Gate,” in San Francisco Bay. The mural’s title is a verse from the poem “On the Prospect of Planting Arts and Learning in America” by Bishop George Berkeley (1685–1753). Emanuel Leutze (1816–1868) was born in Germany and trained as an artist in the United States and Europe. He is known primarily for paintings of American history, particularly his 1851 Washington Crossing the Delaware. The mural’s border features portraits of pioneers William Clark (on the left) and Daniel Boone (on the right). William Clark (1770–1838), accompanied by Meriwether Lewis (1774–1809), led a federal survey of the Oregon Territory from 1804 to 1806, opening the way for western settlement. Daniel Boone (1734–1820) explored the Kentucky region and displayed legendary courage in battles against the British and Indians. Beneath Clark’s and Boone’s portraits are quotations from Jonathan M. Sewall’s prologue and epilogue, respectively, to Cato, A Tragedy by Joseph Addison. Captain Montgomery C. Meigs, superintendent of construction of the Capitol extensions and new Dome, commissioned the 20-by-30-foot mural in July 1861 for $20,000. In preparation for painting the mural, Leutze traveled to the Colorado region in the summer of that year to sketch the Rocky Mountains. In two early oil sketches for Westward the Course of Empire Takes its Way (one on view at the Smithsonian American Art Museum), Leutze did not include the African American youth depicted in the center of the mural. His decision to portray this freed slave may have been influenced by the emancipation of slaves in the District of Columbia in 1862. Leutze painted the mural using a German technique called stereochromy, in which pigments are applied to plaster and sealed with waterglass, a silica solution that preserves and enhances the colors. The mural was cleaned and conserved in 1998–1999. During the Civil War, Leutze painted the mural at the U.S. Capitol uninterrupted from July 1861 to November 1862. He added the American flag as a symbol of the Union.